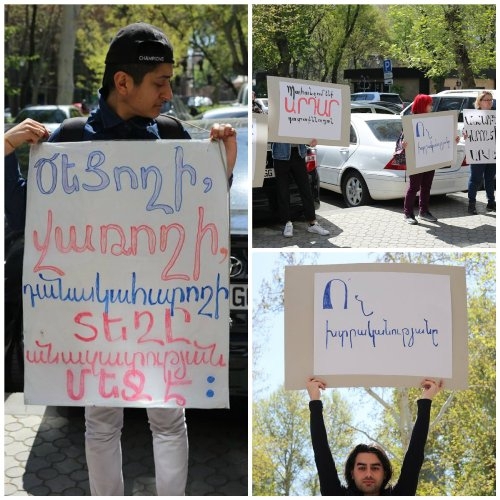 On April 5th dozens of human rights activists defending the rights of sexual minorities demanded from the Prosecutor General's Office of Armenia a fair and comprehensive investigation of hate crimes in Armenia. Referring to the stabbing incident of a 15-year-old in the adjacent area of Komaygi park in Yerevan in the evening of April 1st, to whom an alleged homosexual orientation was attributed, as well as the beating and burning of the apartment of a transgender woman, the protestors noted that in both of the mentioned cases the offenders were set free. The protestors demanded that equality and fair trial be ensured for all since most of them are confident that the facts of beating a transgender woman and burning the apartment she rented are not going to be considered and won't be punished on grounds of discrimination because that is the practice of law enforcement in Armenia. The «Right Side» NGO defending the rights and interests of LGBT people announced that a criminal case has been initiated on the incident. According to them the lives of LGBT people in Armenia are endangered. There is no week without a case of discrimination of an LGBT representative, especially a transgender. After each incident there are threats against them, including in the social networks». The reaction of law enforcement authorities towards cases of crimes against LGBT people is neither adequate nor fair: they often avoid applying to law enforcement authorities since even here they come across discriminatory and intolerant attitude. LGBT people also avoid publicity. According to Greta Khachatryan, one of the organizers of the demonstration, LGBT people avoid being seen on public: «Our society has turned transgender people into night-life people. An LGBT individual doesn't even speak out about his/her problems even if beaten or subjected to violence. He/she thinks that law will not be applied and the case will be dismissed». As Khachatryan said, even medical institutions are intolerant towards LGBT people. «4 years ago two transgender people were taken out of «Izmirlyan» Medical Centre after learning about their gender identity». According to research more than 70 percent of respondents have a negative attitude towards LGBTI (lesbian, gay, bisexual, transgender and intersex) people, more than 27 percent talk about them using offensive words and obscene language. 93 percent of respondents said that they would not like to have a homosexual neighbor.